Happy Friday! In this minisode we meet with Tim Chambers of Missouri Plain Folk, who tells us the importance of color in antiques. He shows us how even simple utilitarian items can have a whole new appeal, depending on what shade they were painted. You can see more great dealers and antiques at the upcoming Fox Valley Antiques Show in October! Today we are joined by the lovely Colleen Alpers, as she tells us about her charming child's rocking horse from the late 1800's! This rocking horse was one of the first types of rocking horses ever made, because of its matchstick legs. You can find more wonderful antiques like this at the upcoming fall Fox Valley Antiques Show! Happy Thursday! In this minisode, Bob Zordani of Z and K Antiques shows us a beautiful pair of portraits that were painted in 1850. They are believed to have been given as wedding gifts. You can see more great dealers and antiques at the upcoming Fox Valley Antiques Show in October! 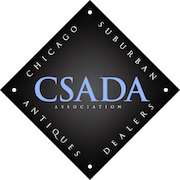 Tonight we are joined by Brendan Edgerton of Country Cupboard Antiques, as he tells us about his journey as a dealer at the Fox Valley Antiques Show. Brendan gives us great insight into the significance of buying old vs. new, and how important it is for the younger generation to get involved with antiques. We were sad that we couldn't film at the spring Fox Valley show this year, but we will be sure to come to the next show in the fall! Good evening everyone, we hope you all had a fantastic weekend! Tonight's new minisode features Greg Thiele of Carriage House Americana - Greg Thiele! Greg shows us his beautiful 1850s goat cart. This cart was most likely used as a children's toy, in a similar fashion to the red toy wagons we still see today. We're back with another new minisode from the Fox Valley Antiques Show! Bryan Green, of H. Lanny Green & Sons, was nice enough to give us a great lesson on American Windsor Chairs! That fan back looks pretty dang good for being made in 1790! Don't forget to check out the next Fox Valley show coming up in October! Happy Wednesday! Today were bringing you a new minisode featuring Jason Sword! Jason shows us his antique beadboard cabinet, which was made between 1890 and 1900. Make sure to check out the next Fox Valley Antiques Show to see more great pieces like this one!